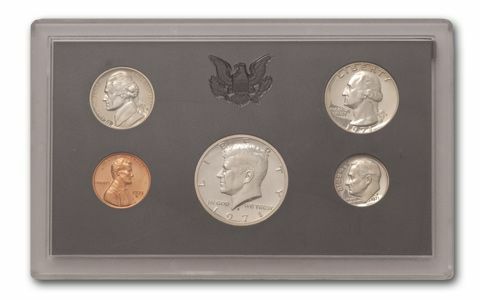 The 1971-S Proof Set was again a Proof Set collectors dream. Another "S"-less coin was discovered, as well as a few very rare Doubled Die varieties. About the sets: 1971-S Proof Coins are found with Brilliant, Cameo, and Deep Cameo surfaces. All three finishes are readily available. None of the new Eisenhower Dollars were included in the 1971-S Proof Sets. However, Proof 40% Silver Clad versions of the 1971-S Eisenhower Dollar were available separately. An estimated 1,655 Proof 1971-S Nickels were struck without a mintmark. 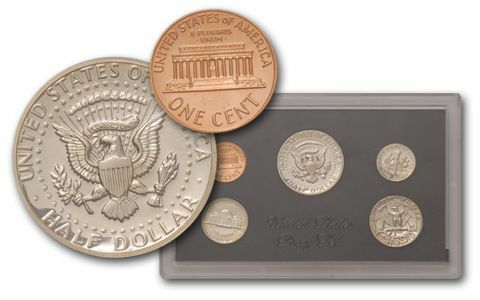 Although Proof coins were being struck at the San Francisco Mint at the time, the Philadelphia Mint was responsible for making the Proof dies (and adding the mintmark). Apparently, at least one die was sent from Philadelphia without the mintmark, and a small number of "S"-less Nickels were struck and released before the error was discovered. The mintage figure, provided by the Mint, was apparently based on the estimated output from a single die pair. Because the "S"-less Proof sets are very valuable, be sure to examine the plastic case for signs of tampering and substitution. Do not purchase an individual "S"-less Nickel or complete Proof Set unless it has been authenticated by an expert. Look closely at the Cents in your 1971 Proof Sets - you may get lucky and find one of the three very rare Doubled Die Obverses (all three varieties show doubling on "IN GOD WE TRUST" and "LIBERTY"). Similarly, a rare Doubled Die Obverse Half Dollar variety shows doubling on "IN GOD WE TRUST" and "LIBERTY". 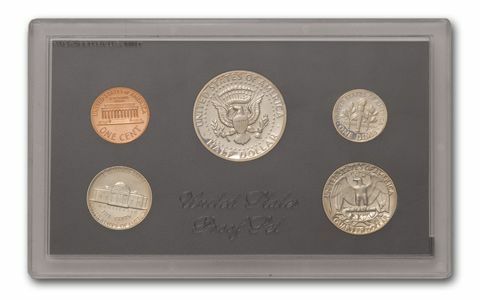 Original packaging: The individual coins of the 1971-S Proof Set were placed into holes in a black plastic insert, then sealed in a two-piece, clear plastic case. 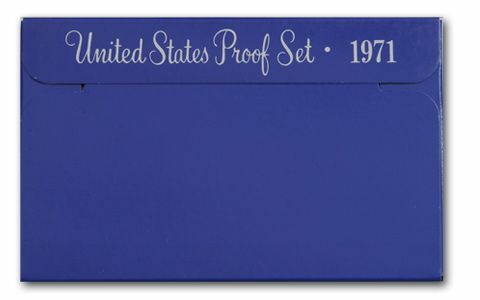 The case was then inserted into a protective outer cover consisting of blue cardboard, imprinted with the words: "United States Proof Set • 1971."